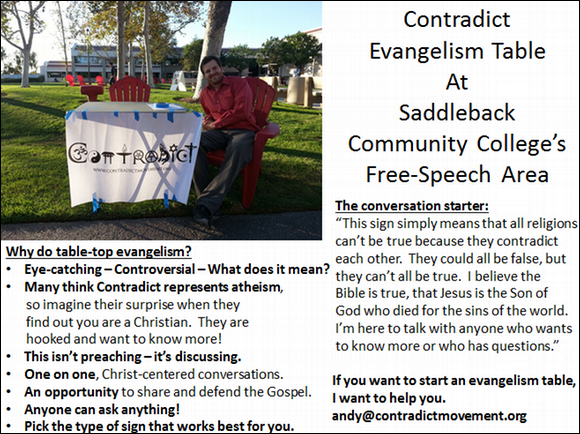 As many of you know if you have followed my blog, the Contradict logo was birthed from evangelism at University of California Irvine. From many trial and error attempts at initiating Christ-centered conversations on the campus, I found that the best method for my personality is to set-up a table and draw people in to talk with a catchy poster on a table. My first attempt was a Led Zeppelin poster with a sign saying free bootleg CDs. I actually had purchased some bootleg CDs and was raffling them off, but, to enter the raffle the person had to take my “Stairway to Heaven” Gospel tract that I had written. They also got an invitation to a Bible study on UCI’s campus. I got a few emails this way so I could keep in contact – spamming people, if you will, about events I was hosting on campus. I never got anyone to show to those events – :(. Then I met a lady that was a full-time missionary at University California Los Angeles. She told me what worked best for her was hosting a “Blessing of the Brains” night every mid-term and finals week. She said students were up late studying and that she would offer them coffee and the opportunity to have their brains blessed with prayer! She would pray for them right then and there if they wanted, or just collect prayer requests in a prayer box. I did that method twice! Both times – very successful. All of these attempts were when I was as an undergraduate student at Concordia University Irvine during the 2004-2005 and 2005-2006 school years. After a Masters degree and three years teaching in China, I was back in Orange County in the summer of 2009 and asked if I would kickstart evangelism for a congregation at UCI. I wanted to set-up another table with a poster that would draw people in to talk and I wanted to also offer coffee. Sort of a combination of the two best options I had done before. I had many other attempts along the way that I won’t mention. From UCLA pastor, Mark Jasa, I learned of a cool sign approach to evangelism. He set-up a table with a poster that read, “Religion is for the Weak.” His approach was that people would see this and not know what he believed! People usually think he is an atheist, and then get caught off guard and are intrigued to hear more when they find out he is actually a Christian. He presents that everyone is going to die and religion offers a solution to the problem, yet there are really only two religions – Free and Not Free. Christianity is the only Free religion – saved by grace through faith in Christ. Then the discussion begins! Adam Stetson also saw a presentation from Pastor Jasa on his “Religion is for the Weak” method of starting an evangelism conversation. Together we bought a table and went to UCI’s Freedom of Speech Area. We started with small print-out pages that said “Religion is for the Weak” and other slogans we came up with. The only one I still remember is the one that I made up which was “Christianity is not a way of life.” If someone asked what it meant I’d share, “Christianity is life given to you for free by the work of Jesus. It’s not a list of rules you must obey to be saved. Therefore it is not a way of life, it is life.” We also had a big poster board that said, “Got Prayer?” We did a lot of stuff like that. It was a smorgasbord of little flyers taped to everything on the table. People would get coffee and as they shook their sugar into their cup, they’d ask what the message meant on the sugar container. It was quite comical. One week, Adam said, he wanted to make a Contradict sign to counter Co-exist. I thought it was great! I found a few designs already made online and we started to use them on the table too. It became my go to every time someone asked why were out there giving out free coffee. Adam and the others with us began to always gravitate towards it too. Eventually Adam had a Contradict poster made! And then we ditched everything else and just used a Contradict poster exclusively, taped to the front of the table. “Religion is for the Weak” didn’t work so great for me for some reason. Before launching the site http://www.contradictmovement.org, I designed my own Contradict logo with my friend Danny Martinez. I love the Contradict conversation starter. It’s simple. Someone asks what does this mean and I get to simply say, “It means that all religions contradict each other and they can’t all be true. They could all be false, but they can’t all be true. I personally believe Christianity is true, that Jesus is God and died for your sins and I am here to share that good news and answer any of your questions about what I believe from the Bible.” I have presented the central truth-claim of Christianity, and now the ball is in that person’s court! Often times, they might be shocked that I am Christian. For example, I once let an atheist talk a long time about his views on religion. He thought I was an atheist too, so he was just laying it really thick against all religions and religious people, and when I told him what I believed he was stunned. And his mouth was open, and he asked, “Wait, you’re a Christian?” He thought by Contradict, I somehow meant they were all wrong! No. It means they can’t all be true, not that they’re all wrong – which is what many people first think the sign means. Anyways, it’s a great conversation starter! I encourage you to give it a try somewhere, at a park, a campus, a store front, a fair, a street corner with a lot of foot traffic. There are handouts at http://www.contradictmovement.org that you can download and print for free. If you are really into this idea, I encourage you to check out my book, Contradict – They Can’t All Be True. It details the entire message I’d share with someone if they gave me 3-4 hours of their time. And believe it or not, sometimes, people actually give that much time! Many people I have talked to are very intrigued. They are craving God (although they don’t know that’s what they’re missing and needing as they are lost in their sins) and few Christians have given them the straight up truth from Scripture. And few Christians have sat there to listen to their questions and answer them. A big portion of my book is to help equip you to know what questions are most often asked from the Contradict conversation starter. Here’s a video for more info on how to get started. God bless you. Please, let me know if you give this a try. And you might find that something else besides Contradict works best for you. Previous Post Boycott and Support A&E! How do I do that? Next Post Christ’s States of Humiliation and Exaltation! Greetings in the name of our Lord Jesus Christ! Your passion and confidence encourages me. I would like to set up a free evangelism table at California universities as well. How can I receive permission. Also, here is a website that I hope will bless you. http://www.Baptizingfire.com.